Contents: Introduction. M.H. 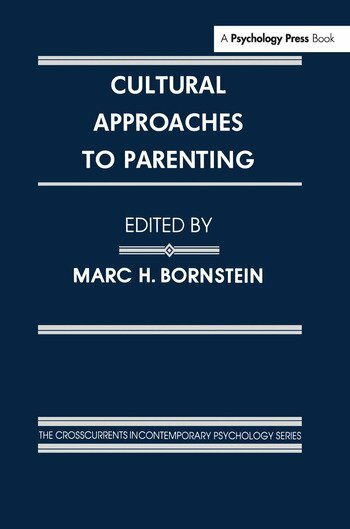 Bornstein, Approaches to Parenting in Culture. Part I: Conceptions of Parenting: Cultural Attitudes and Actions. H. Papousek, M. Papousek, Innate and Cultural Guidance of Infants' Integrative Competencies: China, The United States, and Germany. A. Pomerleau, G. Malcuit, C. Sabatier, Child-Rearing Practices and Parental Beliefs in Three Cultural Groups of Montreal: Quebecois, Vietnamese, Haitian. M.H. Bornstein, J. Tal, C.S. Tamis-LeMonda, Parenting in Cross-Cultural Perspective: The United States, France, and Japan. G.A. Morelli, E.Z. Tronick, Parenting and Child Development in the Efe Foragers and Lese Farmers of Zaire. T.B. Brazelton, Discussion: Cultural Attitudes and Actions. Part II: Consequences of Parenting: Dynamics of Enculturation. M. Sigman, T.D. Wachs, Structure, Continuity, and Nutritional Correlates of Caregiver Behavior Patterns in Kenya and Egypt. M. Shatz, Using Cross-Cultural Research to Inform Us About the Role of Language in Development: Comparisons of Japanese, Korean, and English, and of German, American English, and British English. J. Dunn, J. Brown, Becoming American or English? Talking About the Social World in England and the United States. B. Rogoff, J. Mistry, A. Goncu, C. Mosier, Cultural Variation in the Role Relations of Toddlers and Their Families. W. Kessen, Commentary: Dynamics of Enculturation. "...a thoughtful first step in applying current observational methods of family study to cross-cultural inquiry." "...expands the understanding of parenting and provides valuable insight into multicultural families and their children....a welcome divergence from mainstream psychology's traditional monocultural perspective." "...a splendid example of the 'new' wave of cross-cultural child developmental research."